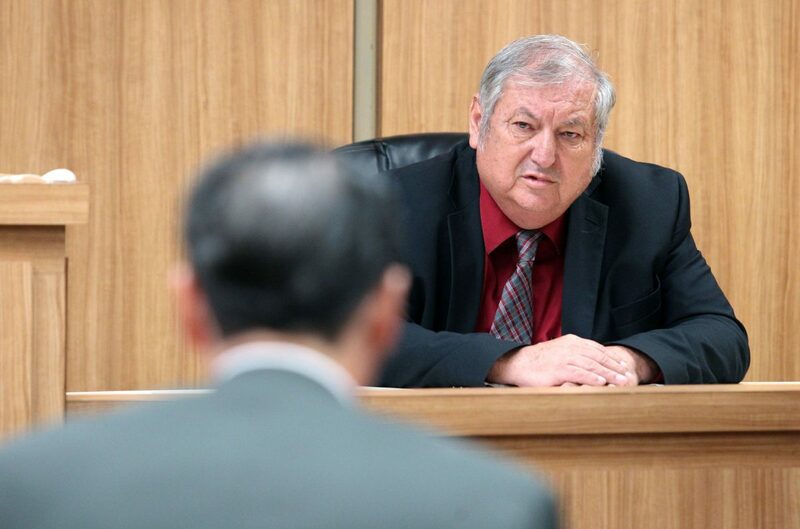 EDINBURG — Mission Mayor Armando O’Caña took the stand Wednesday in the trial over the Mission election contest, fielding questions about how his campaign was run in the lead-up to the June mayoral runoff election. O’Caña, who defeated former Mission Mayor Norberto “Beto” Salinas in the runoff, made his first appearance during the trial on Wednesday. His attorneys explained he was making funeral arrangements following a death in the family. Ricardo “Rick” Salinas, the attorney for his father Beto Salinas who is contesting the results of the runoff, began by asking O’Caña if he understood the allegations made against his campaign. O’Caña replied that he understood and that the allegations were false. O’Caña, 64, first became a city councilman for Mission about 15 years ago, he said in response to Salinas’ questions. He had also previously run for mayor against Beto Salinas but lost. Through questions about his history of running for public office, Rick Salinas hoped to establish that O’Caña was familiar with how campaigns were run and questioned O’Caña over the campaign finance reports that he filed. Salinas spent much time going over the contributions and expenses O’Caña reported, asking O’Caña repeatedly if he had paid any campaign workers. O’Caña said he did not. Salinas brought up the people who were named in previous days’ testimony as having bribed people for their votes or having filled out ballots for elderly voters. O’Caña said he never asked those people to help in the campaign. The attorney also made note of payments to VO Consulting, a consulting firm owned by his niece, Veronica O’Caña, whom Armando O’Caña said he hired to be his campaign manager. He testified he and Veronica had a verbal agreement that she would receive $20,000 for her work in the general election and another $8,000 if he went into a runoff election. O’Caña agreed with Salinas’ assessment that he received roughly $39,000 in contributions for the entire campaign. O’Caña testified that Veronica never produced documentation to show how she used the money she was paid, to which Salinas insinuated she could have used those funds to pay people to harvest votes. Salinas then asked O’Caña if he was aware they had tried to subpoena Veronica O’Caña to compel her to testify but they were unable to locate her. He alleged their process servers had even staked out at her home, but she refused to come out. Salinas asked O’Caña if he would speak to Veronica and Guadalupe “Lupita” O’Caña, Veronica’s mother, about coming forward to testify. O’Caña said he would speak to them. After O’Caña was finally excused from the witness stand, Salinas called four more witnesses including a married couple who said they voted by absentee ballot for the first time during this election. The couple, Emma and Guadalupe Barrera, individually testified that a woman came to their home to help them fill out their absentee ballots which they both said they had not requested. When they were shown copies of absentee ballot applications with their signatures on them, both said those were not their real signatures. The woman who came to their home to help them, Guadalupe Barrera said, filled out the ballot for them and took it with her. They said they did not know which campaign she worked for. The next witnesses, Serapio De la Cruz, said “some girls” came by his home to pick up his absentee ballot, but he could not remember who they were and could not remember giving a sworn statement to the attorneys. The attorneys argued over the last witness, Juanita Hernandez, who Hinojosa said was had not been properly designated. Salinas argued that the affidavit he provided Hinojosa was enough notice that he would be calling her as a witness. The judge agreed. Hernandez testified that a woman came to her home and told her she would be receiving a ballot in the mail. Because of vision problems, she could not read the statement she had given to attorneys, but she remembered stating that both Veronica O’Caña and Lupita O’Caña came to her home. Hernandez was excused soon after that. When asked how many days he expected to take to make his case, Salinas replied that there were at least 50 other subpoenas that had been issued. Judge J. Bonner Dorsey, however, ordered that Salinas be done presenting witnesses by Thursday, Oct. 4 at noon. Whether the trial will even make that far is now in question after the attorneys got into another heated argument after the judge recessed for the day. This dispute centered over Salinas’ request that Hinojosa turn over documents he would use as part of the defense, but Hinojosa argued he needed a list of the witnesses Salinas planned to call in the next few days to know what documents he would be using. As the bickering continued, the judge threatened to declare a mistrial if the issues couldn’t be resolved. The attorneys agreed to try to reach an agreement by Thursday morning, otherwise the judge will consider a mistrial.